So, what is it? 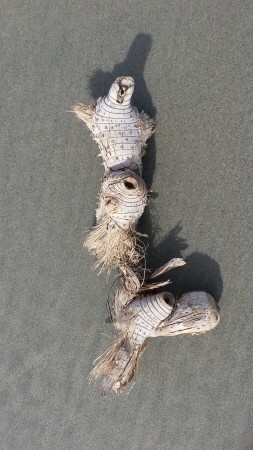 A fractional part of something, a kelp root, quite desiccated? It is so very fibrous, like a knob of ginger stuffed with dried noodles, twisted and scarred and tough and delicate. I think it is stunningly gorgeous. It is perhaps eight inches long, and it also resembles a branch with growth rings on the outside, and little freckles and hairs. This was apparently washed up, drying at low tide, tangled into the mounds of stones near the cliff edges. Or was it fallen, a part of some other root structure from above? I belong to a textile/fiber group of artists. Three of them make basket-like sculptures. This twisted structure would be a great inspiration to them, I should think. Nature leads the way.